Three-time Group 1 winner Redkirk Warrior gears up for a return to the track in tonight’s $200,000 Group 2 Australia Stakes (1200m). Last seen first-up in November’s VRC Sprint Classic (1200m) finishing a disappointing 10th, trainer Tom Dabernig thinks the eight-year-old veteran is building towards something pretty special this time around. “I think that we took him to the UK which didn’t work for him, and then he came back from that trip and he wasn’t quite the same,” Daebernig told RSN’s Racing Pulse. Redkirk Warrior, above, is on the second line of betting ahead of tonight’s Australia Stakes. Redkirk Warrior is an $8.00 chance ahead of tonight’s race after finishing 10th in his last three starts. 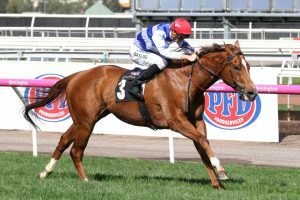 Redkirk’s last win came at Flemington in the Group 1 Newmarket Handicap (1200m) in March, but with a talented field locked in at Moonee Valley tonight, nothing will come easy. “I think if we ride him a bit patiently, I think we’ll see him charge to the line. If he’s back to his best, he’s clearly the best form horse in the race” Daebernig said. Redkirk Warrior has drawn barrier 8 for the race and will need a bit of luck down the straight if he is to beat home the likes of Brave Smash, Land of Plenty and $3.70 favourite, Whispering Brook. Daebernig still expects jockey Regan Bayliss to remain patient and look to sit off the speed. “He’s drawn a gate where we can be a little bit patient early, I think there’s always pretty good pressure in this, so provided we can get taken into it and come down the middle, I think he’ll be finishing strong. A strong showing is vitally important for Redkirk Warrior if he is to impress the voters ahead of March’s All-Star Mile. He is also nominated to defend his title in the Newmarket Handicap a week prior.